Heat oven to 350°F. Wrap outside bottom and side of 9-inch springform pan with heavy-duty foil to prevent leaking. Spray inside bottom and side of pan with cooking spray. In small bowl, mix crust ingredients. Press in bottom of pan. Bake 8 to 10 minutes or until set. Reduce oven temperature to 300°F. Cool crust 10 minutes. Meanwhile, in large bowl, beat cream cheese, granulated sugar, 1/4 cup rum, the lime peel and lime juice with electric mixer on medium speed until fluffy. Beat in eggs, one at a time, just until blended. Pour filling over crust. Bake at 300°F 55 to 65 minutes or until edge of cheesecake is set at least 2 inches from edge of pan but center of cheesecake still jiggles slightly when moved. Turn oven off; open oven door 4 inches. Let cheesecake remain in oven 30 minutes. Run small metal spatula around edge of pan to loosen cheesecake. Cool in pan on cooling rack 30 minutes. Refrigerate at least 6 hours or overnight. To serve, run small spatula around edge of pan; carefully remove foil and side of pan. In chilled medium bowl, beat topping ingredients with electric mixer on high speed until soft peaks form. 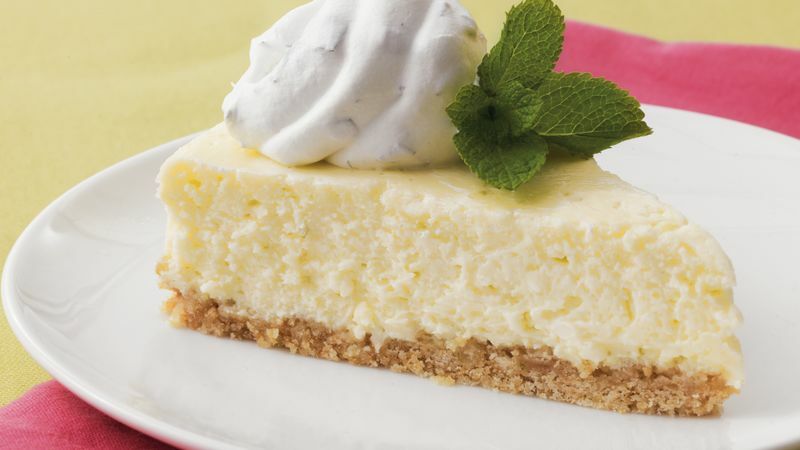 Cut cheesecake into slices; top each slice with whipped cream. Garnish with fresh mint sprig, if desired. Cover; refrigerate any remaining cheesecake.